You are here: Home / Healthy Diet / Health Supplements, Vitamins & Minerals / Rainbow Light Prenatal One Reviews (2019): Is this Vitamin Safe? Ah, pregnancy, that magical time when you’re growing a baby inside you and all your resources go to supporting it thrive, thus leaving you feeling fatigued, nauseated, irritated and bloated. Ok, hold on, let’s back up for a second, it doesn’t all have to be this bad. Pregnancy is a truly magical time, and you should be able to enjoy the experience. Rainbow Light Prenatal One is a reliable, healthy, vegan-friendly and gluten-free multivitamin that keeps your energy up, reduces stress and constipation plus boosts your metabolism. But don’t take our word for it, read the article below! We’ve analyzed all the ingredients, read countless customer reviews, consulted some ob-gyns, plus tried it for ourselves. Can You Take This Vitamin On an Empty Stomach? We want to see that prenatal vitamins contain all the necessary doses of vitamins, folic acid, biotin, copper, iron, and magnesium. And Rainbow Light Prenatal does, with absolutely no trace of chemicals and gluten. Plus, it’s vegan! One thing you can count on is that pregnant women don’t lie about prenatal vitamins. If a product gave them enough energy and helped correct vitamin imbalances, you can rely on it. 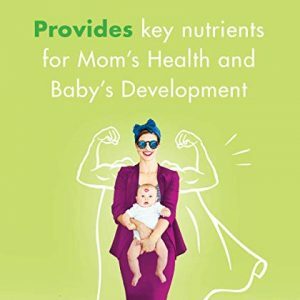 Some women who felt a more acute lack of energy researched and used the best protein powder for breastfeeding and pregnancy alongside this multivitamins. Luckily, someone from our team is pregnant, and we tested these vitamins on her. She is glowing, plus she never experienced any headaches, bloating and constipation that other multi-vitamins caused her. She reduced her morning sickness considerably, and the little one appears to be developing great! 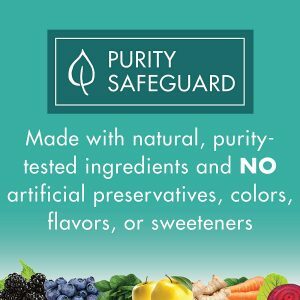 The first thing we noticed while reading the ingredients list is that they’re all natural, with no artificial preservatives, colors, sweeteners or any flavors. Rainbow Light Prenatal One multivitamins don’t have any fish, shellfish, dairy or eggs, so they’re vegan-friendly. 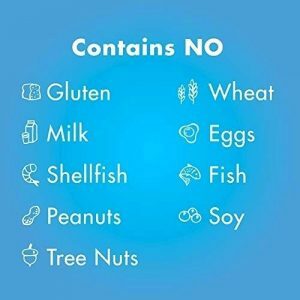 They’re also free of gluten and wheat, tree nuts and peanuts, so they’re great for people with food allergies. During the pregnancy period, your body works extra-hard to help your baby develop. Thanks to evolution, your body will employ all its vitamin and mineral reserves for this purpose, sending them to your young one. While the baby is getting all the best resources to thrive, the mother might find herself at a deficit. But the Prenatal One blend includes all the vitamins your body needs: the B-complex to keep your energy levels up, vitamins A and C for a healthy immune system, vitamin D2 for healthy gums and teeth (we all know how pregnant women struggle with bleeding gums), plus Pantothenic Acid that supports your metabolism. 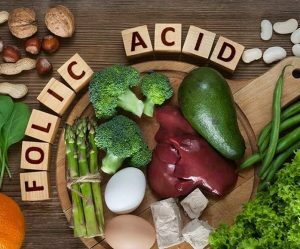 Folic Acid is essential for preventing any neural tube defects in your baby, like spina bifida. Even though some of these defects can be corrected after giving birth, it’s better to prevent them. The old formula used to contain 800 micrograms of folic acid, but the new formula has 600 micrograms. That’s because there have been some recent changes when it comes to the necessary daily intakes of various vitamins, and Rainbow Light changed its formula accordingly. A mix of spirulina, red raspberry, and ginger, along with organic beetroot, broccoli, kale, spinach, carrots, and cranberries make these vitamins truly stomach-friendly. These ingredients help fight morning sickness and are very gentle on your stomach. According to Rainbow One, this means you can take Prenatal One on an empty stomach without any side effects. 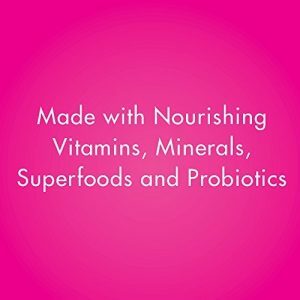 There are about 25 million CFU probiotics along with some enzymes I can’t pronounce, which you can read on the list of ingredients. These are safe, and help improve your digestion. Probiotics help keep your good gut bacteria happy so that they can fight bad intruder-bacteria. It helps your immune system as well as your digestion so that you can avoid pregnancy-associated constipation. Among the minerals you can see on the list of ingredients, iron is essential to support the mother’s red blood cells development. During pregnancy, your body works hard to produce extra blood, which can cause anemia. 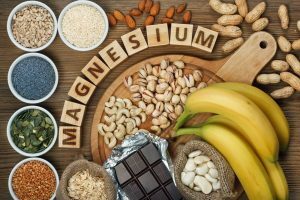 We also like the high levels of magnesium that decrease stress and increase energy levels, calcium that supports bone health, plus selenium to improve the immune system health and fight chronic diseases like high blood pressure. Prenatal One is packed with all the nutrients your body needs to nourish your baby while keeping you healthy and strong. Prenatal one can be used throughout your pregnancy as well as during the breastfeeding period. Prenatal One has zeros almost throughout its nutrition facts: zero calories, zero fat, zero cholesterol, no sodium, no carbs, sugar or protein. So taking this multivitamin won’t add to your daily calories, which is impressive for pregnancy. 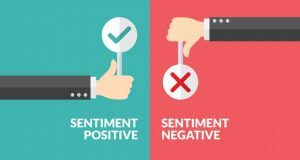 There are lots of interesting findings when reading label info. Firstly, you might notice that the new formula has different proportions of ingredients when compared to the old one. As we’ve explained before, this is because the regulations concerning necessary daily intakes have changed. Secondly, if you’re pregnant and over 35, you can also try Rainbow Light Prenatal 35+. 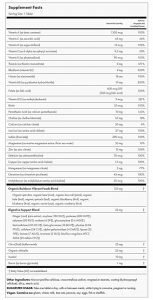 Prenatal One label states these vitamins are not evaluated by the FDA, but many ob-gyns recommend them. Merely reading the list of ingredients tells you these are safe to use, with no artificial or dangerous chemicals. Yes you can. The combination of superfoods such asspirulina, ginger, and raspberry plus all the plant-source enzymes and probiotics enhance digestion and allow you to take this vitamin on an empty stomach. 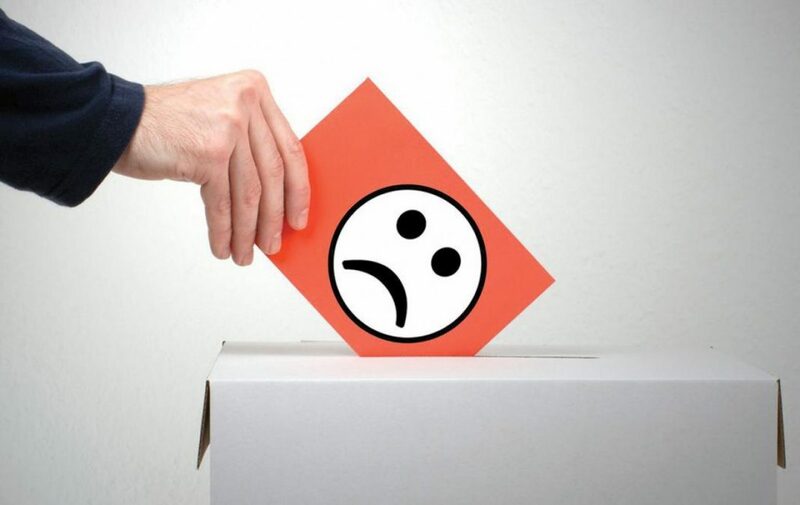 The majority of online reviewers attest to this. Some women who had digestion issues and nausea even before getting pregnant are more likely not to tolerate these multivitamins on an empty stomach. Consumers are generally happy with the product, as well as Prenatal DHA and Rainbow Light Prenatal Daily Duo. There are no side effects to these multivitamins, and women are so glad that they only have to take one pill per day. 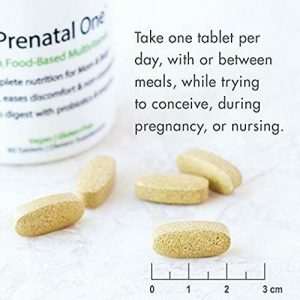 All pregnant and nursing women who use Prenatal One Multivitamin say they tolerate the multivitamin well, and that they see improvements in digestion, energy levels and overall immunity to colds. Some pregnant women are afraid to take multivitamins during their pregnancy because iron can make you constipated. Thanks to the stomach-friendly iron formula, Prenatal One doesn’t do that, and it can help you keep a good bathroom schedule. The most common issues are that the pill is pretty large and that it makes your pee an intense yellow. That can scare mothers into thinking they’re dehydrated, but it’s just the excess vitamins that your body doesn’t need which are eliminated through urine. There’s been some controversy around Rainbow Light Prenatal One recall. Some women have noticed brown spots on their pills, which they say could be mold due to improper storing conditions. However, considering the high levels of minerals in these multivitamins, especially iron, it could also be oxidation. Keep in mind that just a few users have dealt with this issue. One of the best multivitamins available today, Prenatal One boosts your energy, helps you relax, improves your metabolism and immune system, plus it’s not constipating. Rainbow Light Prenatal One contains all your recommended daily dose of biotin, folic acid, vitamin C, copper, iron, magnesium, and the vitamin B complex. With no added chemicals, this vegan and gluten-free multivitamin’s only real disadvantage is the pill size. If this bothers you, though, try Rainbow Light Prenatal Precious Gems Gummies. Some pregnant women who feel very weak might also need the Baby Booster Prenatal Protein Powder. You can get all these products on Amazon for a user-friendly price and all the shipping benefits!